Made of sturdy aluminum with the officially licensed, world famous Guinness logo printed on front, this cap catcher is a fine addition to any home bar or man cave. Keep your caps under control and proclaim your love of Black Gold all at once with this fabulous Guinness Beer Bottle Cap Catcher. It includes two mounting screw for easy installation that's finished in a flash. Just pop it under your wall mounted bottle opener and start drinking! Stop chasing caps and add some flair to your hangout space with this handy Guinness Beer Bottle Cap Catcher. Order yours today! 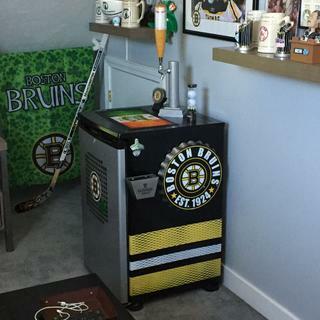 Looks great under my Guinness bottle opener on my beer fridge !!! To replace The ratty soup can Im using now. Again...I am a huge Guinness fan and collector.